Symptoms included cough, headache, sore throat and fever. 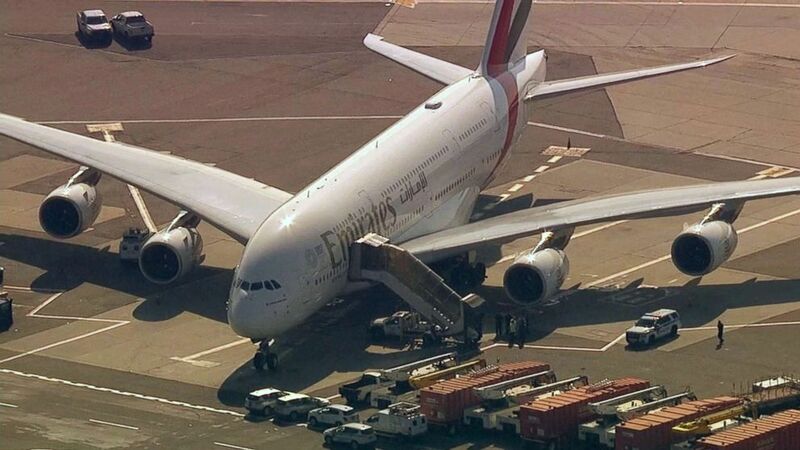 Three passengers and seven crew members who fell ill on an Emirates flight from Dubai were taken to a hospital after the flight landed in New York City Wednesday morning, according to the airline. Symptoms included cough, headache, sore throat and fever, according to Jamaica Hospital. Nine more people with symptoms were evaluated at the airport and refused medical attention, Eric Phillips, the New York City mayor's press secretary, wrote on Twitter. 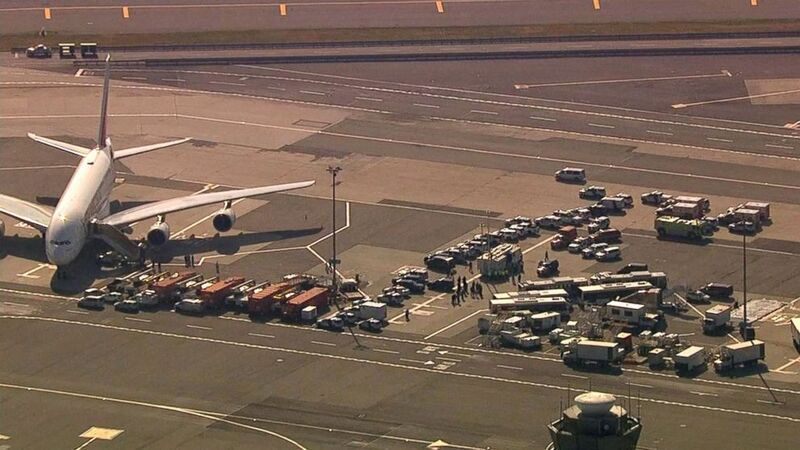 (WABC) A United Emirates flight sits on the tarmac at JFK International Airport in New York with possible sick passengers on board, Sept. 5, 2018. All of the passengers were screened as they got off the plane and health officials are working to determine the cause of the illness, Phillips added. All of the passengers who were not ill have been allowed to leave and clear customs at JFK, officials said. Emirates flight 203 had declared a medical emergency and landed at John F. Kennedy airport at 9:10 a.m., the Federal Aviation Administration said in a statement. The plane -- with roughly 521 passengers on board -- was quarantined and kept away from the terminal after it landed, Phillips said. 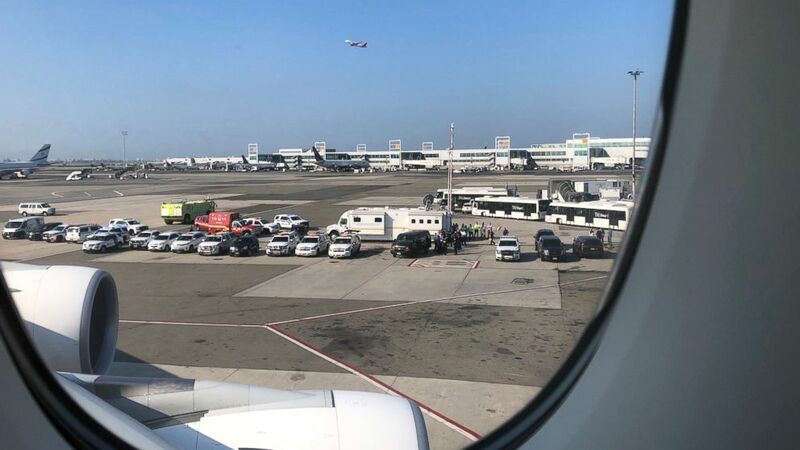 (@LarryCoben/Twitter) First responders are gathered on the tarmac in a photo shared by passenger on board a United Emirates flight that landed at JFK airport in New York with possible sick passengers on board, Sept. 5, 2018. The flu is being investigated as a possible culprit, two sources told ABC News. 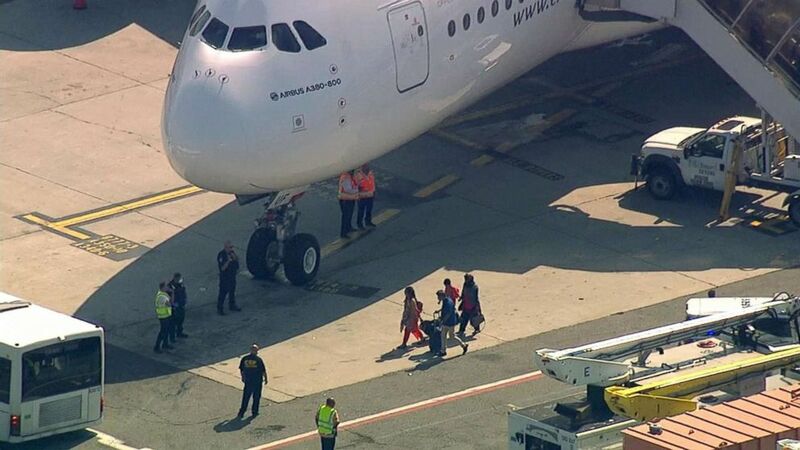 Officials from the Centers for Disease Control and Prevention boarded the plane to evaluate the situation before passengers disembarked, according to the Port Authority of New York and New Jersey. The passengers were screened by the CDC and processed by U.S. Customs & Border Protection without incident, officials said. (WABC) Passengers walk to a waiting shuttle after disembarking a United Emirates plane that landed at JFK International Airport in New York on Sept. 5, 2018. 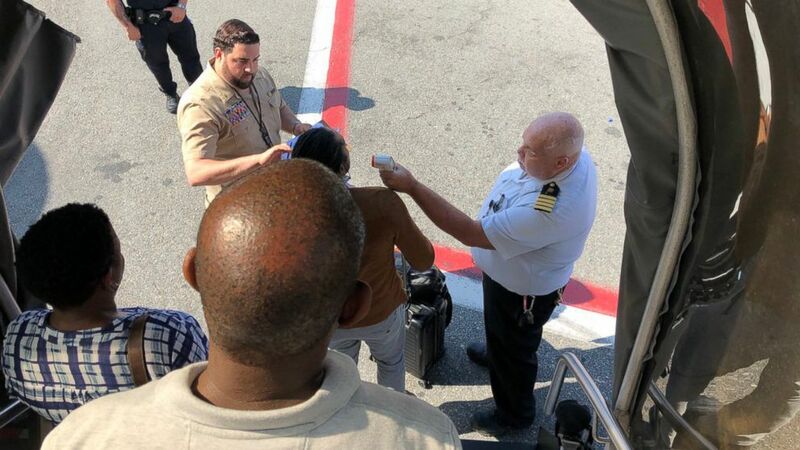 (Larry Coben/Twitter) Disembarking passengers have their temperatures checked in a photo shared by a passenger after a United Emirates plane landed at JFK International Airport in New York, Sept. 5, 2018. The plane has since been returned to Emirates, the airline said. The return flight from New York to Dubai will be delayed by about three hours, the airline said. "We apologise to our customers for any inconvenience caused," Emirates said in a statement. "The safety and wellbeing of our customers and crew is always our top priority." ABC News' Jeff Cook and Mike Levine contributed to this report.